The stock market crash of October 29, 1929 marked the beginning of America's Great Depression. Not much improved in park thereafter until FERA ( Federal Emergency Relief Administration established in 1932) did a small amount of work. 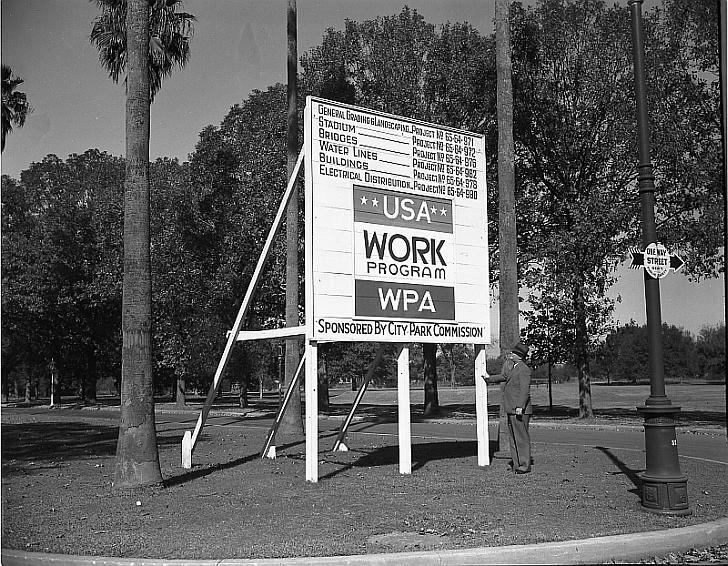 But when the WPA (established in 1935) came to the park it became a different place – workers restored, renovated, improved, and added new buildings, bridges, and roads..
Renovations, repairs, and improvements were made to Roosevelt Mall, the Rose Garden, the Casino, the Irby Pool, the Peristyle, and sculptures throughout the park. Popp Fountain was completed, 3 bridges rebuilt, City Park Avenue widened, Navarre Road paved, Lelong Avenue repaved, and Anseman Avenue landscaped. The swampy northern extension was drained and the Couturie Forest established. The lagoons were converted into a stream system with new drainage.